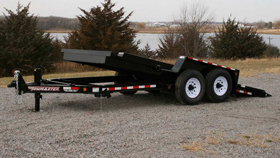 The Towmaster® drop-deck tilt trailers are popular with rental dealers and small contractors. There are no ramps to hassle with; simply tilt the deck and drive on or off. 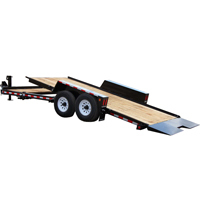 This trailer is built on our cold-formed I-beam tongue and main frame for tough durability. The tilt deck trailer features a single lever twin-latch system, knife-edge approach plate, rubber-ride axles and adjustable hitch. A deck cushion cylinder eases the deck back into transport position and prevents equipment from slamming the deck down.